Black is back! 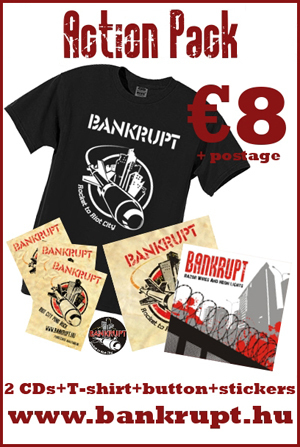 The classic black Rocket design Bankrupt T-shirts are in stock again in all sizes as well as navy blue ones. They only cost 6 euros, but it’s even better to get the Action Pack with the 2 last CDs and a button included for only 8 euros. This is definitely the best price/value ratio out there if you were looking for an affordable punk rock present for Christmas. Visit our webshop now, and take a look at the CD-pack bargain deals too! This entry was posted in band news and tagged action pack, christmas, present, shop, t-shirt by admin. Bookmark the permalink.